New Jersey Junction Railroad Co. Uncanceled Bond signed by J. Pierpont Morgan and Harris Charles Fahnestock - 100 Year Railroad Bond! J. Pierpont Morgan (1837-1913), Banker, Connoisseur of Art, son of Junius S. Morgan. Involved in his early years in a broad range of finance, his company, J. P. Morgan & Co. became one of the most powerful banking houses in the world. He engaged in several dubious pieces of business during the Civil War period, but was essentially an organizer and stabilizing force in business. After the failure of Jay Cooke's firm, Morgan's firm became dominant in government financing and in financing railroads. Among his most daring undertakings was the formation of the US Steel Corp. in 1901. Morgan's personal influence was a decisive factor in overcoming the money panic of 1907. 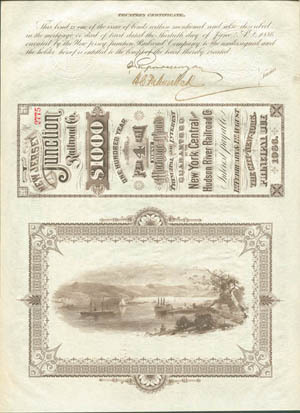 Superb 100 year bond of the New Jersey Junction Railroad dated 1886, nearly four pages of attractive coupons remaining. The bond is boldly signed at back by J. Pierpont Morgan and Harris Charles Fahnestock as Trustees. A large impressive vignette of a harbor scene is also at the back. Graphically beautiful both front and back. Includes nice portraits of both Morgan and Fahnestock. Superb Near Mint Condition!!! Any other type of stock or bond signed by Morgan will sell in the $2,000 or more range. This Bond is a Great Value at this Special Price!! !